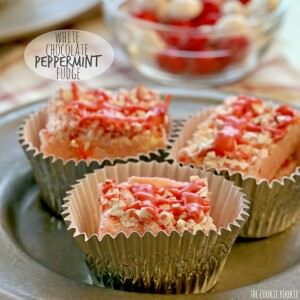 No fail White Chocolate Peppermint Fudge is the perfect Christmas treat! In a medium saucepan, melt white chocolate chips, butter, and sweetened condensed milk over low heat until fully melted and smooth. Stir in pudding mix and continue to stir until creamy. Stir in the marshmallow cream and stir to melt until fully combined. Stir in a couple drops of food coloring (optional). Take off of heat and allow to cool for 1-2 minutes. Stir in the M&Ms. Pour into an 8x8 pan that has been lined with wax paper. Sprinkle the crushed candy canes on top of the fudge and drizzle with more white chocolate (I used some red food coloring in my white chocolate drizzle as well) if desired. Refrigerate until set and then slice and serve. Enjoy!